Look like you’re going to set sail on an old world luxury cruise liner in this Shabby Apple “Bon Voyage” dress. Shabby Apple is an online boutique that specializes in feminine, flirty dresses and other clothing designed for women, by women. Read on to find out how to win the Shabby Apple Dress Giveaway! Many of Shabby Apple’s designs are travel-inspired, with collections taking names from destinations like the Amalfi Coast, South Pacific, the Silk Road, and Manhattan. This “Bon Voyage” dress is part of their Classics collection. Check out Travels with Shabby to take a trip around the world via fashion. 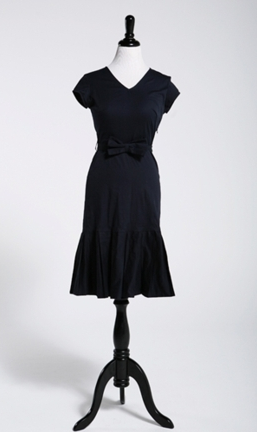 When I was asked by Shabby Apple to select a dress for this giveaway, I chose this navy number because 1) I thought it would be flattering on various body types, 2) I loved its travel-inspired name “Bon Voyage” and 3) I just really wanted this adorable dress. I wore it on date night with the hubs but it would be super cute to wear to a bridal or baby shower, or for brunch with the gals. Here’s what a normal person looks like in the dress. And by normal, I mean a non-model, who clearly does not know what to do with her hands when posing. Namely, me. Shabby Apple wants you to feel and look fabulous in their fashions. Take their three-question body type quiz to help you find dresses that emphasize your assets. Although women’s dresses are their specialty, Shabby Apple also offers other items like skirts, fitness wear, swimsuits, shoes (don’t get me started on how cute their shoes are! ), kids’ clothing, and even sassy vintage aprons. Go check out the Shabby Apple website and see what I mean. But be careful, if you’re anything like me, you could wind up falling in love with the site and wishing you could purchase almost everything you see! Enter to win the Shabby Apple Dress Giveaway! While Shabby Apple has lots of darling dresses and other items to choose from, this giveaway is for a brand-new “Bon Voyage” dress (worth $78) in the size of your choice. This contest is open to U.S. residents only. You must be at least 18 to enter. A Note from The Travel Mama: This giveaway brought to you by Shabby Apple. I received a complimentary dress to review and Shabby Apple will provide another dress to the winner. Opinions, as always, are my own. I would never recommend something I don’t truly like. I love the Bon Voyage dress….thanks for the chance to win one. I also love the Pina Colada dress. I love the l’Ete dress! I love the Puca Pucara, it is gorgeous! I love red queen dress. I love the beverly hills dress. I like the Hollywood Hills! Thanks! I like the Mariposa Dress. I love the Extra Credit dress. The San Gabriel dress is my favorite! I love the Desert Bloom dress! I love the Overboard dress! So cute!! The carnival dress is lovely! I love the Ahoy! dress. I love the I’m Late, I’m Late dress. The Tow the Line dress is really cute. My favorite is the Beauty Mark dress! I adore the CEO dress.